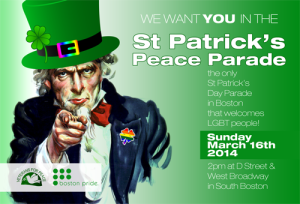 Boston, MA – Saturday, March 15th – We and our LGBTQ organizations and communities wish to show solidarity with Veterans for Peace and all they have done to carry the message of unity between our community and the Peace Movement in the Saint Patrick’s Peace Parade. There are many LGBTQ veterans in Vets for Peace (locally and nationwide) and their entire organization has shown great integrity and support for the LGBTQ community. We speak with one voice regarding this issue and urge the traditional St. Patrick’s Parade organizers to accept the Veterans for Peace and all other honorable and peace-loving groups to be in the traditional parade. It would not be enough for us, just to win the right for the LGBTQ to march in the traditional parade. We will not leave our sisters and brothers from Veterans for Peace behind. For more info about the Peace Parade, click here.